3-Reel Rags To Riches Classic Slot Guide & Review - Casino Answers! 3-Reel Rags To Riches is a 3-reel, 1-line classic slot machine developed by Cryptologic, featuring a bonus game and a progressive jackpot. You can play the Rags To Riches slot machine at VIP Casino and Casino Joy. As with many progressive jackpot slots, Rags To Riches has a fixed coin size of $1. To play Rags To Riches, you must either hit the “Bet One” button once or twice, followed by the “Spin Reels” button or simply hit “Bet Max” to play all 3 coins. The lowest total bet you can make on the Rags To Riches classic progressive jackpot slot is $1. The highest total bet you can make on a spin is $3. Casino Answers strongly recommends playing the maximum bet of $3 per spin at all times to be eligible for the progressive jackpot. As mentioned earlier in this review, Rags To Riches is linked to a progressive jackpot. At the time of this writing, that progressive jackpot is currently at $49,700 and rising fast. If you thought that was a lot, the Rags To Riches Progressive Jackpot can go as high as over $400,000 before it is won! To try to win the Rags to Riches Progressive Jackpot, visit VIP Casino! 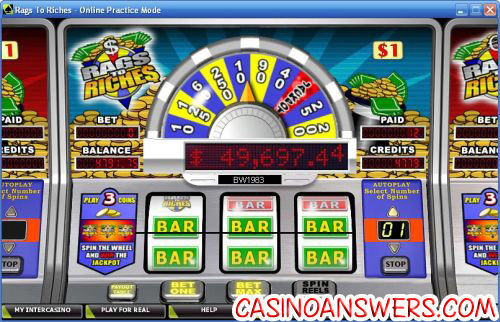 In order to win the progressive jackpot, you must first trigger the Rags To Riches wheel bonus game. To do that, you must hit 3 Rags To Riches symbols on a maximum bet spin. For the jackpot to be won, you must spin the wheel and it must land on “Jackpot.” Otherwise, you will win a lesser prize. The top fixed jackpot symbol on the 3-Reel Rags To Riches classic slot is the Top Hat symbol. If you hit 3 Top Hat symbols on a spin in Rags To Riches, you will win 1500 coins. The Bindle symbol is the second highest paying symbol in the regular slot game; 3 Bindles are worth 450 coins. If you’re not looking to stop playing Rags To Riches until you have won the progressive jackpot, the autoplay feature can come in handy. Using the buttons next to the reels, you can set autoplay to play up to 99 autoplay spins. Hit “Spin Reels” or “Bet Max” to start the autoplay feature once you have set how many spins you wish to play. You can stop the autoplay feature at any time by hitting the “Stop” button. Rags To Riches is a fun twist on the progressive jackpot slot. Rather than a winning combination or a random progressive jackpot, Rags To Riches gives you the chance to win the progressive jackpot through a bonus game. You can try and go from Rags To Riches yourself by playing this progressive jackpot slot machine at VIP Casino! How do I win the Rags To Riches Progressive Jackpot? To win the progressive jackpot on the 3-reel version of Rags To Riches, you must first hit 3 Rags To Riches symbol to activate the spin the wheel bonus game. Once you get into the bonus game, you must land the spinner on “Jackpot” to win the gigantic progressive jackpot that can easily convert rags into riches. Are players from the United States able to play for the Rags To Riches progressive jackpot? 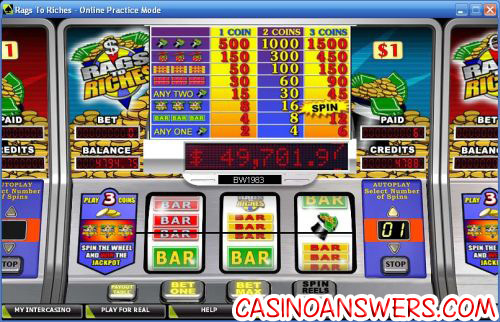 Regrettably, players based in the USA are not able to play Rags To Riches or win the progressive jackpot. For progressive jackpot slots that are US-friendly, please read our Jackpot Pinatas RTG Progressive Jackpot Video Slot Review, Money Magic Rival Progressive Jackpot Video Slot Review and our Red, White and Win Vegas Tech Progressive Jackpot Slot Review. Isn’t Rags To Riches a 5-reel video slot game? Yes, there are two versions of the Rags To Riches slot available at VIP Casino. There is the 3-reel, 1-line classic slot version that we are reviewing here and there is the 5-reel, 20-line video slot version as well. You can play both Rags To Riches games at VIP Casino and Casino Joy. Where can I play a Flash game of the Rags To Riches slot machine? You can play a Flash game of Rags To Riches for real money at VIP Flash Casino. This is the best way for Macintosh users to play for the Rags To Riches progressive jackpot. If you experience any difficulties with the Instant Play casino software, make sure you have the latest version of Adobe Flash Player installed on your computer. Where can I play the 3 reel version of rags to riches?